Johnnye Merle's Gardens: Some of our new Annies Annuals! 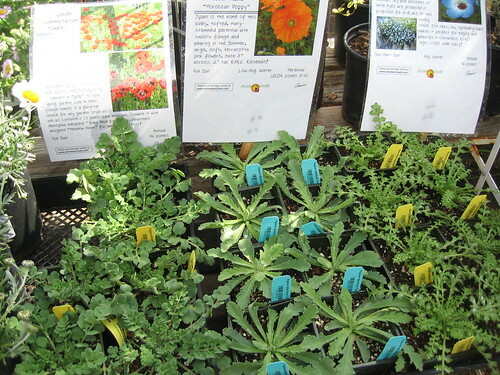 As you probably know, one of our favorite growers is Oakland based Annies Annuals. We've been getting plants shipped down almost weekly this spring, and for good reason, as Annie's (and despite the name, it's annuals AND perennials!) grows some of the coolest stuff we have ever seen! 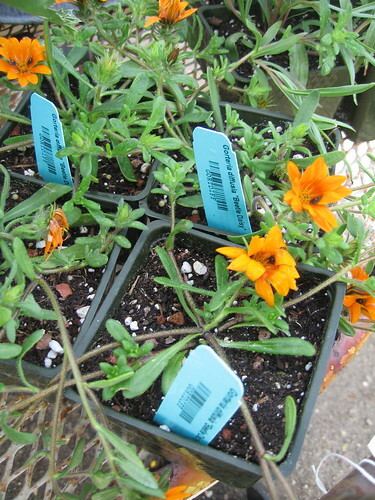 We are proud to be one of only a handful of Orange County nurseries that carry their products. 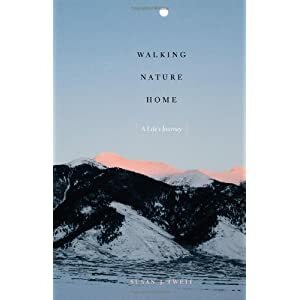 Below you'll find just a few of the very cool selections of Annie's products that we have available - we have more in stock, more on the way next week, and you can always place a special order as well! 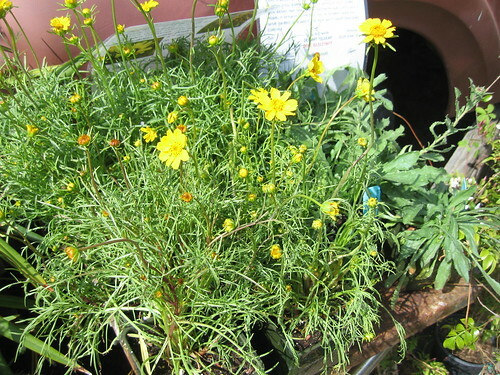 Coreopsis stillmanii "Golden Fleece" is one of our favorites right now. We love love LOVE coreposis in general, and this variety is awesome! It bears brilliant golden-yellow flowers 2” across on long stems, is 2’ tall, and is a good cut flower. Gorteria diffusia "Beetle Daisy" is soooo cool. It gets it's name because it looks like it has a bug on the flower - it doesn't, rather, the flower has this unusual blue/black spotting. We are really into orange right now - don't ask, we just are! - and this plant fits our current obsession perfectly! Long blooming from June thru October, it bears bright orange daisies, some with two purply-black dots that look like eyes. Low and spreading, 4" x 15", it's drought tolerant and naturally grows in clay soil but does just as well in regular garden soil. 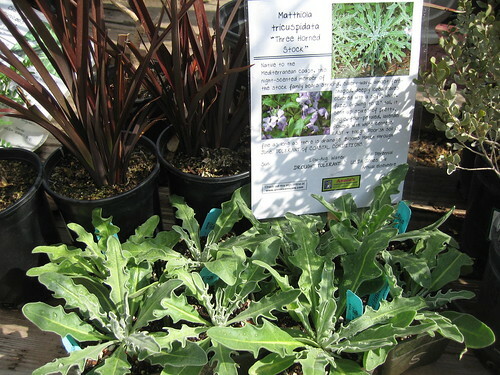 Matthiola tricuspidata is another cool, unusual Annie's Annuals selection. Native to the Mediterranean coast, this night-scented member of the stock family bears striking, silvery-wavy, almost fern-shaped, deeply lobed leaves covered with a soft, white, fuzz. 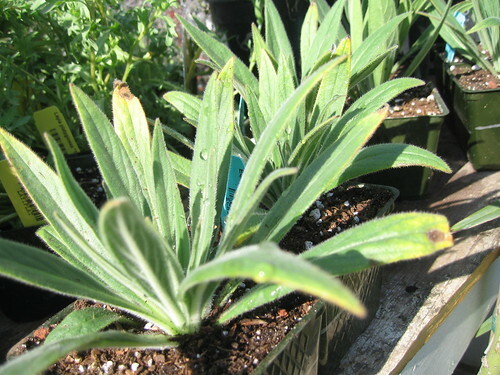 Growing to 2’ tall, it sent up spikes of pretty, single, four-petaled, lavender flowers with white centers. Does particularly well in coastal conditions. Echium wildpretii "Tower of Jewels" is awesome!!! Rosy-red flowers in huge, tapered, conical clusters up to a foot thick (!) and 6-10' tall. It spends its first year as an attractive silver-gray rosette and then spikes its second year in mid-late Spring - we swear we've seen it bloom it's first year though. When all the countless little flowers have faded, the plant dies, leaving behind lots of seedlings which will flower the next year. Does well in POOR TO DRY SOIL (not clay), good at the seacoast. These featured plants are only a handful out of the dozens of cool Annie's we have in stock right now - come in and check more of them out for yourself, and be sure to email us with any special requests!